In the past year, search engine optimization has undergone a massive shift. SEO experts have had to reexamine how to create successful content in 2019. Search engines focus on delivering a better user experience. They reward content geared towards UX. Pedestal has taken a look at the trends in search engine changes and in what content is getting results to determine the core Google ranking signals in 2019. Page engagement metrics are the biggest ranking factor for search engines today. They are the best indicators of engagement with your site. These metrics include factors like number of visitors to the site, number of pages viewed, time on page, and bounce rate. Strong performance in these factors indicates that a page is relevant to the search query and that there is a good user experience. These are positive engagement metrics that the site more relevant to the searcher. By rewarding pages with strong engagement search engines improve their user experience. As a result, they are able to gain and retain more visitors, making their services more valuable and profitable. Inbound links and referring domains continue to play an important role in Google ranking. The quality and relevancy of the link and referring domain are continually becoming more important. The more competitive your product or industry, the more important link building becomes. In competitive fields, top performers are all about equally optimized. So off page elements have more impact on Google ranking. Having a lot of inbound links can give your page a big boost in search engine rankings. But that depends on the diversity, quality, and relevance of the referring domains. A low-quality domain can actually have a negative impact on your ranking. These look like spam tactics to search engines. As a result, these can actually lead to Google ranking penalties. Earning high-quality links can be harder but has more payoff. A single link from an active website with strong domain authority is worth more than multiple low-quality links. The best referring domains for SEO are .gov and .edu links. Search engines give higher trust to government and educational websites. These are also some of the hardest links to earn. One of the easiest ways to earn a .edu inbound link is to offer a donation or scholarship. The way we need to look at keywords in 2019 is changing. Articles should be approached with keyword categories in mind, instead of individual keywords. Google is now able to better interpret meaning. So it doesn’t need to be spoon-fed exact keywords anymore. Writing with keyword categories creates more opportunity to rank on variations and keywords with similar intent. Individual terms are still important, especially long-tailed keywords. But they do not need heavy use. Writing should be done with the topic in mind. Putting the topic as your main focus instead of keyword stuffing improves your ranking and readability. This improves reader engagement metrics and increases the number of terms you can rank on. Creating a better experience for readers is key to SEO success. Improving readability is crucial, as it affects all of the above search engine ranking signals. Well-written, audience focused content makes better use of keywords, earns more inbound links, and gets better page engagement. For most websites, a conversational tone is the best approach for improving readability. It flows more naturally and better connects with readers. The approach to content length can also use a refresh. In past years, suggestions for content length have continually been to go longer and longer. Today, that is not always the best approach. Yes, longer content does offer more opportunity to rank for keywords. But, it also runs a higher risk of bouncing readers. Smartphone usage dictates user behaviour. 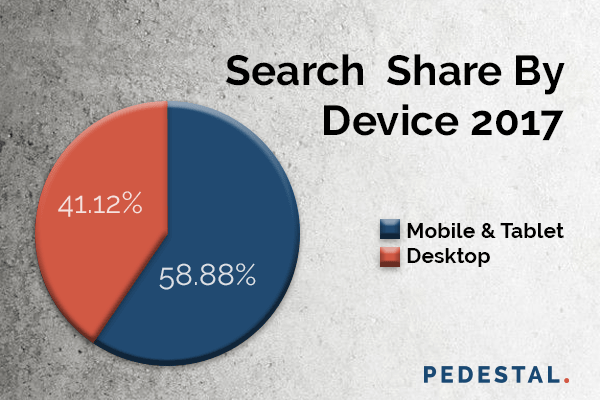 Mobile and tablet use now accounts for nearly 60% of search traffic. As a result, SEO content is relying more heavily on mobile readers. Longer content does not always benefit mobile readers. Long content is often filled with not only keyword stuffing, but filler content for the sake of length. Mobile readers are quicker to abandon sites. Long content can be good, but its length should be determined by the amount of useful content, not for the sake of length itself. Success with Google ranking signals requires up-to-date SEO knowledge. To get your site to rank organically on the search engines you need to work with the best SEO services. Get your free marketing assessment today by contacting Pedestal.